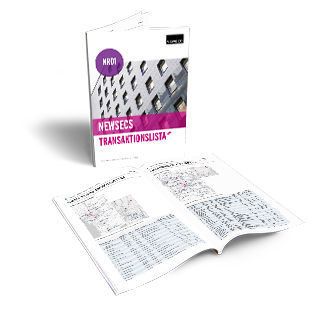 Newsec's transaction list is published every quarter and gives the reader up-to-date information about the commercial property transactions that have taken place on the Swedish market in all property segments. The list covers all types of property and all known transactions from SEK 50 million upward. The list contains information about the transactions' size, segment, price and the players involved. It also gives totalled statistics about volumes, etc. In a unique and effective way the transaction list keeps you updated about what's happening in the property world. Download the latest edition below.